Many people are expected to descend on an Oxfordshire village this coming weekend to participate in the annual World Pooh Sticks Championship. Little Wittenhan on Thames River at Day’s Lock is the venue for this year’s championship which is to be held on Sunday, March 30. This will be the 25th time that the event will have taken place. 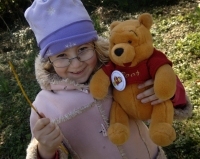 The children’s story Winnie the Pooh is the inspiration for this event which have been written by AA Milne and teams from as far as United States shall take part in the event. The event’s organizer David Caswell told that he expected a massive turnout once more. He told that a team from America had already entered the field while attempts were begin made to get one from Canada. Previously teams from the Czech Republic, Russia and even Australia have participated in the event. Pooh sticks happens to be an event where in teams drop sticks from over a bridge into a flowing river below and then run to the opposite side to check out which one comes out first. There is a certain standard that has been set where sticks have to finish a 20-yard course. The Sinodum Rotary Club is considering ending its association with this event so the organizers are looking forward to being associated with a new Rotary club next year. Apart from the feature race there are other activities that will take place to mark the anniversary. David Caswell said “We will have various stands and stalls. We will also have the country's only 'teddyatrician' - who will be on hand to fix children's damaged teddy bears." The money raised from this event goes to charity, 51% is handed over to the Royal National Lifeboat Institution and the rest 49% to Sinodun Rotary Club's charity account. Entrance fee to the race is priced at £1.50 for individuals and £5 per team. You can also visit pooh-sticks.com for more details.